Hello. Without getting into the "why's" of it, American shooters are in the midst of an ammunition shortage. At the same time, dedicated defensive shooters understand that effective shooting is a "perishible skill", one that doesn't "care" if ammunition is readily available or not. 1. Be tailored to a specific number of shots, varying upon how "deep" one's "ammunition pockets" are? 2. Be easily remembered and open to some variation? 3. Provide at least some reasonable level of defensive competence with the snub? First, I make no claims as a firearm instructor of any note. Though I still do a very little individual instructing, my days as a police firearm instructor are long ended. None of these "drills" bear my name, nor am I interested in them doing so. If you think that they might be of service, have at 'em. If not, don't. They are merely suggestions that might be of some use. 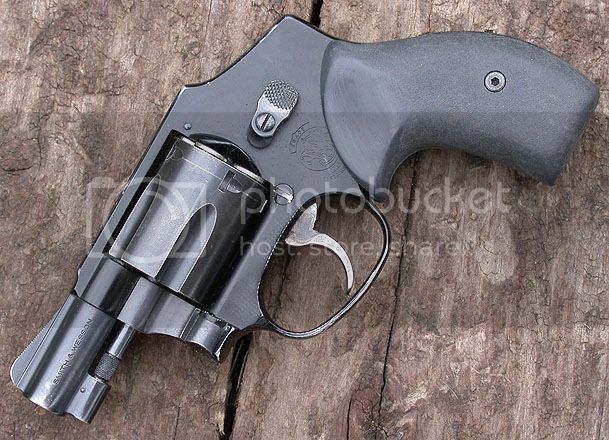 This revolver was a BUG to my visible duty sidearm for several years before retirement. It shows a little wear but was never abused, although it was carried almost every day...or night. Shooting: All shots fired today were done at close range and w/o rest. Some was done two-hand with practice being done with both the strong and off hands as well. No shot fired today was over 7 yards. 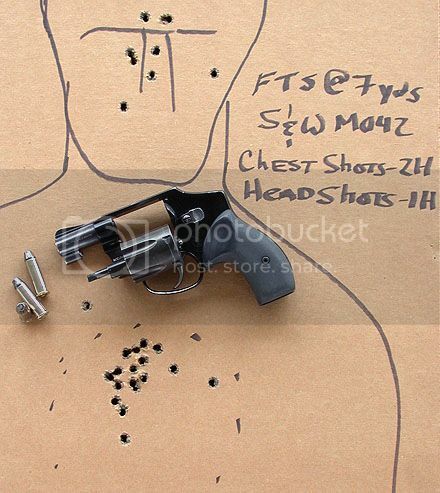 Failure to Stop: This is the traditional "Mozambique Drill" that amounts to two quick shots to the upper torso, a brief assessment and a shot to the head if required. Usually a two-hand hold is used for all three shots. In this instance, I used two for the chest shots and then only my off (left) hand for the head shots. In real life, there is nothing that says that we might not receive an injured hand while delivering the first shot or two. Certainly, the drill can be done in the traditional two-hand manner all the way through or as I've done it here with but the weak hand for the final shot. One could also use only the strong hand for the final shot if desired. Each run of the exercise required either three shots. I began from the low-ready position using a two-hand hold. I did time each run but my times are not relevant to other shooters. Your time might be faster or slower than mine, but so long as we are all seeking to improve (or at least not deteriorate), we can set our own "personal best" and bettering it whenever we can! 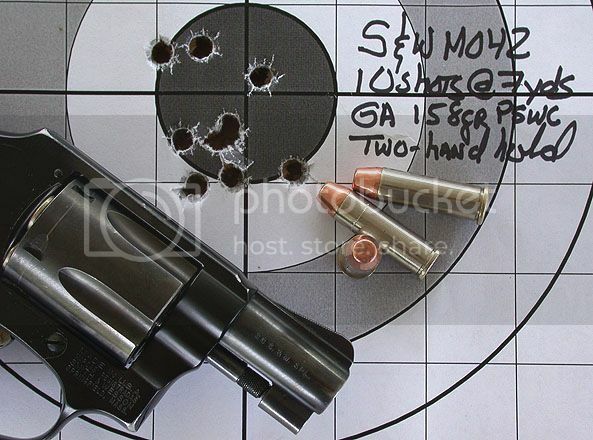 If you are new to shooting lightweight snubs, go slow but be smooth. Have no wasted motion. In time and with proper practice, the speed will come. Speed w/o accuracy is useless in my opinion and could actually harm an innocent bystander, something none of us could stand. Shooting Three Circles: The name given is just off the top of my head and is a fair descriptor of the drill. Draw three dotted-line circles small enough to require at least coarse accuracy when firing at speed. 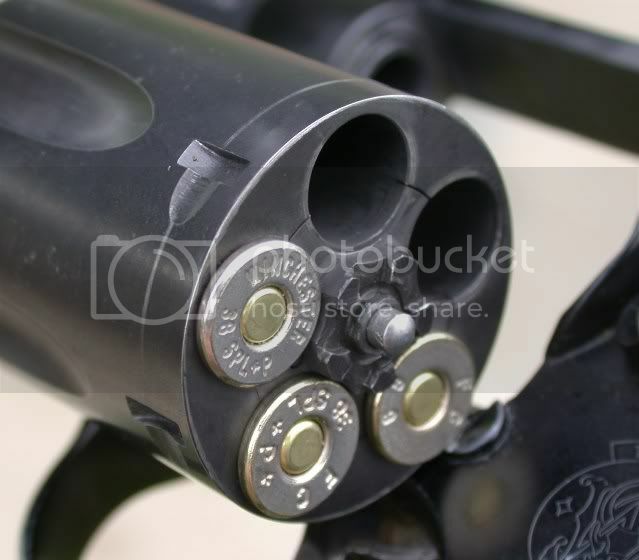 Start with only three rounds in the revolver so that you have to both eject the fired cases and reload such that the first pull of the trigger will fire the first shot. I think being able to get a partial reload up and running ASAP in a defense situation is desireable in the extreme! Loading only a partial cylinder-full and then lining it up so that the first shot goes with the first trigger-pull is good to practice in my view. 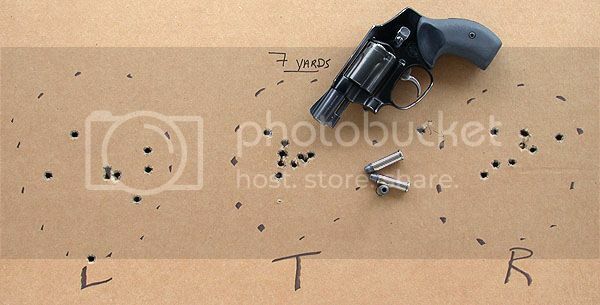 Were we to fumble and drop a couple of shots in a deadly force scenario, it would be a good thing to be able to quickly and w/o thinking, rotate and close the cylinder so that a live round is ready to go. I also suggest practicing ejecting the fired hulls as quickly as possible just to reinforce how difficult it can be with the 1 7/8" bbl's short ejector rod. Finally, I closed out the session doing standard slow-fire bullseye shooting. Two five-shot groups were fired using a two-hand hold at but seven yards. This was not timed and was done simply to "remind" my brain not to jerk the trigger. After shooting "practical" type drills, I find myself jerking the trigger if I'm not careful. I know folks who also share this trait and some who do not. I do it because I think it is necessary for me not to lose any trigger control. If this problem doesn't affect you, it might not be necessary. 3. Can be modified for more or less ammunition, depending upon how much the shooter has or by time-constraints. None of this complicated whatsoever. Neither is it said to be the "best" idea or the "be all - end all" in training. It is merely a suggestion that might be of some use to some folks. 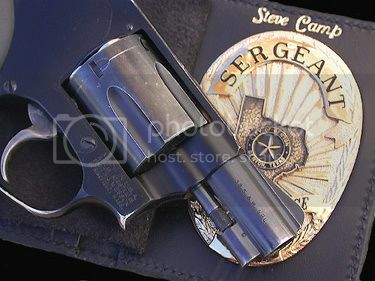 It is one of the things I do on a frequent basis not only with the snub revolver but other sidearms as well.